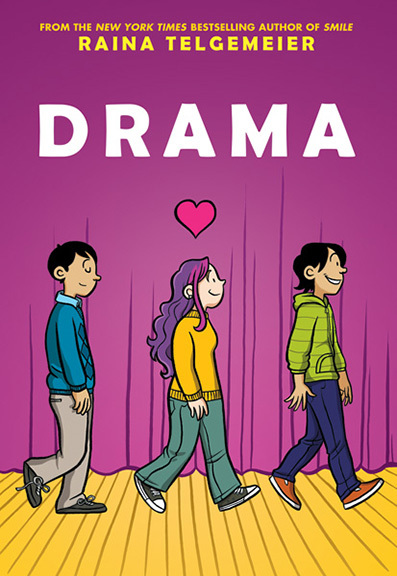 DRAMA by Raina Telgemeier – Video & Sweeps! We’ve never appeared in a play, but we definitely still know all about drama — and that’s because we attended middle school! As you guys know, life at school is more than just classes and homework; there’s a lot of crazy and meaningful stuff that happens in the halls, during lunch period, and in the middle of extra-curricular activities. And at Eucalyptus Middle School, drama certainly abounds. That’s the setting in the new graphic novel DRAMA by Raina Telgemeier, which involves drama both on stage (in the school production of Moon Over Mississippi) and off stage (new friendships, a school dance, tears, laughter, and multiple unrequited crushes). So cool to see an artist in action, isn’t it? And if you like that illustration of Callie, well, you’re in luck! We’re giving away the original illustration and a signed copy of DRAMA to one lucky winner! Enter our sweepstakes below, and stay tuned for a Q&A with Raina in a couple weeks! This sweepstakes is now closed. I think I’ll love it. I think i’ll really like it. I loved this book so much! I never read this book before. Is it awesome? if it is, I will definitely read it!